← I am thankful I get to marry…. We are thankful for baby Susie. 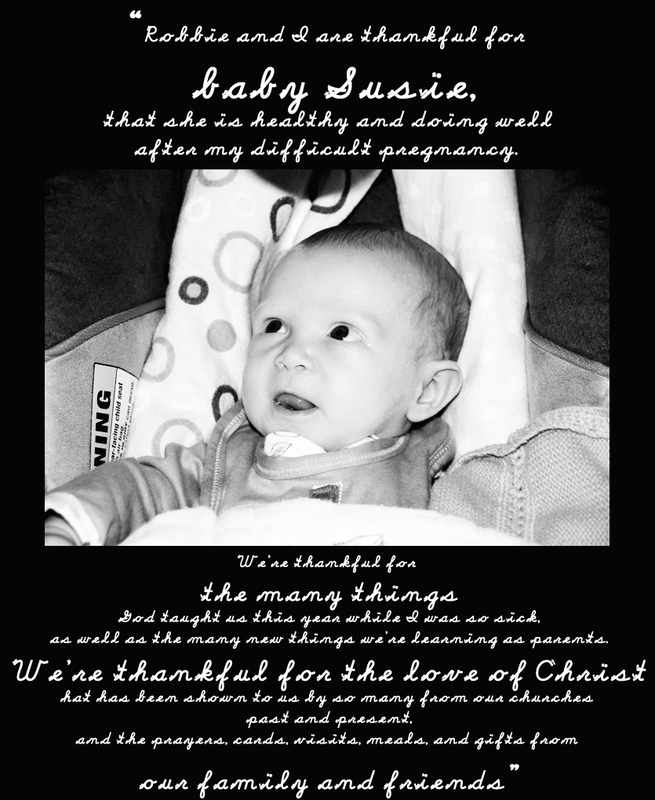 Today on the blog we have another precious baby, Susie. I knew Susie’s parents at college, and have followed from afar their extremely rough pregnancy (as in, Becky was so sick that she had IVs most of the time) and rejoiced in the birth of this sweet little girl. How could you be anything but thankful when looking at this little one? This entry was posted in Uncategorized and tagged baby, friends, God, i am thankful for, Thanksgiving. Bookmark the permalink. 4 Responses to We are thankful for baby Susie. If you are going to use that font, couldn’t you tighten up the kerning so it actually looks like handwriting?